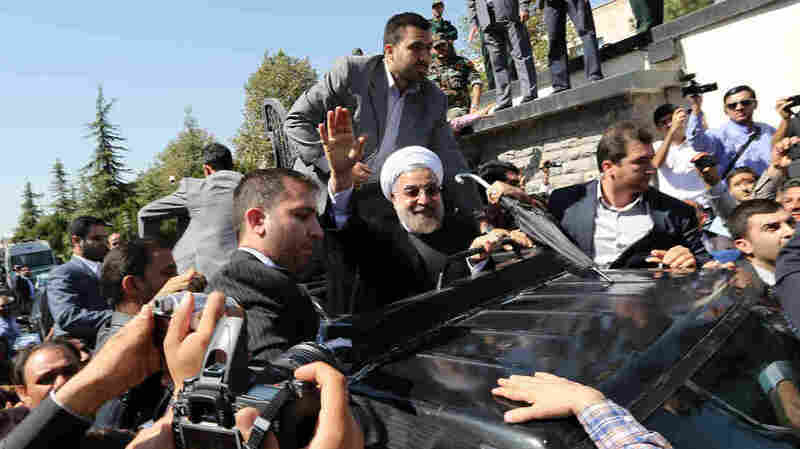 Iran's Rouhani Meets Protests And Cheers After Obama Chat : The Two-Way Despite reports of a shoe being thrown at President Hassan Rouhani's car, he had many backers among the crowds that gathered near Tehran's airport Saturday. Some voiced their support; others criticized the U.S. and Israel. In Iran, President Hassan Rouhani was both celebrated and vilified Saturday for speaking to President Obama by phone during his trip to the United Nations in New York. After Rouhani's return, crowds that gathered near Tehran's airport were divided, with many voicing their support for Rouhani. A hardliner held a sign reading, "Down with USA." One critic threw a shoe at Rouhani's car, according to the Agence France-Presse. "The shoe missed the car and Rouhani stood up through the sunroof to acknowledge the crowds," says the news agency, which reports that Rouhani's supporters outnumbered his opponents. As for how the communication between the two leaders is being treated in the country's news media, "Much of the coverage in Iran ranged from neutral to positive, with hardliners being the main exception," NPR's Peter Kenyon reports. "Rajanews, an outlet linked to Iran's Revolutionary Guard corps," called the Friday phone call from Obama — who reached Rouhani as he was on his way to the airport to leave New York — "useless and weird." The call between Obama and Rouhani represented the first direct contact between the two nation's leaders since 1979, as the Two-Way reported Friday. The White House says the call lasted about 15 minutes and was quickly arranged after Iranian officials said Rouhani would be open to speaking to Obama by phone before he left for Tehran Friday. Obama administration officials had reportedly extended an open offer for a conversation or meeting earlier this week, when both leaders were in New York for a session of the U.N. General Assembly. Rouhani has said he hopes to reach a political solution that allows Iran to keep developing its nuclear program and eases international sanctions. The two leaders agreed on the importance of achieving a peaceful resolution, according to a statement on Iran's presidential website. The statement said the two presidents discussed other topics, as well. "President Rohani and President Obama stressed the necessity for mutual cooperation on different regional issues," according to the site. The two countries' top diplomats — Iranian Foreign Minister Mohammad Javad Zarif and U.S. Secretary of State John Kerry — have been instructed to continue talks between the two countries.